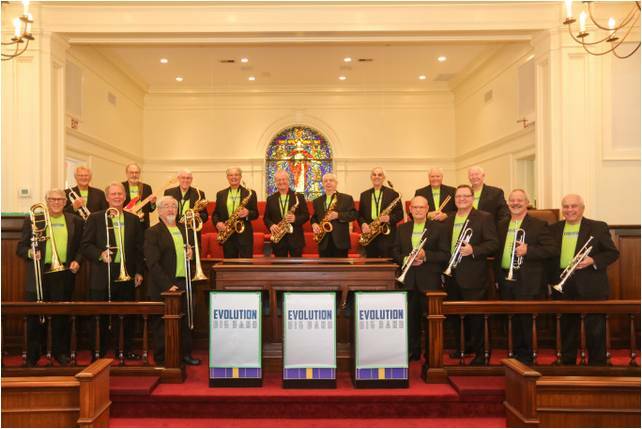 On Sunday, November 19th from 3-4:00 p.m., the Evolution Big Band (formerly the Stardust Orchestra) will perform in concert at BUMC. The Evolution Big Band performs modern arrangements of jazz standards and contemporary big band music. Accordingly, the band has changed its name to the Evolution Big Band to reflect the changing nature of its music. This performance will feature vocals by Michael Schwartzkopf and Miss Penney Lynn Smith. BUMC is pleased to be the rehearsal home for this fine band. Founded in 2004 as the Stardust Orchestra, the all-volunteer group includes some of the top jazz musicians in the Lowcountry who are committed to keeping big band music alive, relevant and contemporary. With a library of more than 2,000 arrangements spanning a range of swing and jazz styles, the band features songs made popular by Glenn Miller, Frank Sinatra, Count Basie, and upbeat arrangements popularized by the Tonight Show Orchestra, Buddy Rich, Michael Buble’ and Nat “King” Cole, among others. A freewill offering will be gratefully received. Please don’t miss this opportunity to hear talented local musicians put on a memorable big band performance.